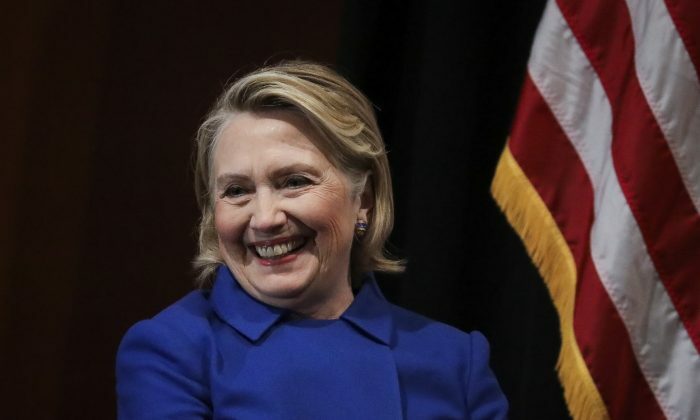 A newly obtained internal message from the Denver-based Platte River Networks firm that serviced the personal email system used by former Secretary of State Hillary Clinton for official diplomatic business referenced a “Hillary cover-up operation work ticket archive cleanup,” the nonprofit government watchdog Judicial Watch said on April 8. The official responded: “Its all part of the Hillary coverup operation. I’ll have to tell you about it at the party.” A smiling emoji was inserted by the responder between the two sentences. She claimed another 32,000 emails were personal and were destroyed using a product known as BleachBit, with no prior independent government review. Former FBI Director James Comey, in a controversial, nationally televised statement, recommended against prosecuting Clinton in July 2016, but that didn’t prevent crowds of supporters of then-Republican presidential candidate Donald Trump from chanting, “Lock her up, lock her up,” during rallies before and after his election victory. Judicial Watch President Tom Fitton told The Epoch Times on April 8 that he wonders “how many smoking guns is it going to take” before a credible and comprehensive investigation is completed.